On Remembrance Sunday 2015 I listened to the names being read out reverently by Brian Kemp, always a moving moment as there are so many names for such a small parish. Commemoration of the 100th anniversary of the First World War started 18 months ago, but it hadn’t occurred to me before to specifically think about the people that lived in our parish who died. I was inspired to start a research project on them, to find out where they lived and when they died, in order to write a short article each month on those who died 100 years before, so that we could remember and honour them individually. Although we’re already one and a half years in, the research I’ve done shows most of our casualties died from 1916 onwards. The few that I have missed I will write about in months where there isn’t someone to remember 100 years before. Someone may have already researched this in the past but, as some of you know, I’m very interested in genealogy and social history, so I’ve done it again for my own interest. However I have drawn a few blanks, so I’d be grateful for any help readers can give. Are you related to anyone on the memorial, or do you know anyone who might be? The stories behind the names of individual soldiers are being revealed during the month of the 100th anniversary of their death. if you do have any information I would love to hear from you. Note: Included with the following entries are a few names of soldiers buried in St.Martin’s Churchyard who’s names don’t appear on our war memorial. The entries are generally in the order they were published in the church magazine. They will ultimately be placed in alphabetical order. I’m nearing the end of this project, and I hope to publish it as a pamphlet to have in the church, and perhaps to sell for church funds, but some of this research was done late at night in time for a magazine deadline so I need to do a lot of cross-checking and referencing first. We are also coming up to perhaps the last significant anniversary of the First World War, the Armistice on Sunday 11th November 2018; I do hope many of you will come to the 10.45am morning Remembrance Day Service to commemorate all these men now that we know a little more about them. On Saturday 10th at 7pm I will be giving a talk in the Brass Crosby Room about the research behind the Chelsfield Casualties of World War 1 - all are welcome to come. If you have any more information about any of the servicemen I’ve written about, or the ones I’m still searching for, please do let me know. The ‘missing’ are William Golding, Sidney Davis, Noah Hillman, William Finn and Walter Matthewson. Or find me in the church tower ringing bells or in the choir at Evensong. 202124 Leading Seaman [Reginald] John Eade of the Royal Navy died at sea on 15 October 1914 aged 31, when the ship he was serving on, HMS Hawke, was torpedoed by a German submarine in the North Sea. He is remembered on the Chatham Naval Memorial. He was the son of William and Martha Ann Eade, who lived at High Street, Green Street Green, and ran a grocer’s shop there for at least 20 years. John lived with his wife Violet at Gads Hill, Gillingham, and in 1911 he’s already in the Navy. His Navy death record shows he had a sister, listed as Mrs Wells, who lived at Cosy Nook, Farnborough. 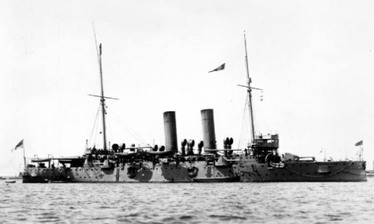 HMS Hawke was an ‘Edgar’ class cruiser launched in 1891. In October 1914, the ship was part of the 10th Cruiser Squadron was deployed further south in the North Sea as part of efforts to stop German warships from attacking a troop convoy from Canada. On 15th October, the squadron was on patrol off Aberdeen, when at 10:30 a single torpedo from the German submarine U-9 (which had sunk three British cruisers on 22nd September), struck Hawke, which quickly capsized. When I searched for more information about HMS Hawke on the internet, and found a listing of all the men who died when the ship sank, it made grim reading. A total of 524 officers and men died, including the ship's captain, Hugh P. E. T. Williams, and there were only 70 survivors. Contemporary newspaper reports said that the survivors reported that the ship sank in 5 minutes, so there was no time for anyone to escape. It was believed the German torpedo had hit very close to the Hawke’s own charges, so the devastation was quadrupled, hence the rapid loss. L/7471 Sergeant Ernest Stanley Mussell of the 1st Battalion of the Queens Own Royal West Kent Regiment was killed in action on 26 October 1914 aged 27. He has no known grave and is remembered on the Le Touret Memorial in France. In September & October 1914 the 1st Battalion RWK’s were stationed in La Bassee and Neuve Chapelle in France, and from 24th to 26th October they were involved in fighting to retain the line in the Battle of La Bassee, so Ernest probably lost his life in the heavy shelling. Ernest was born in Downe in June 1887 and christened in Cudham in July, he was the son of Richard & Ada Mussell. He signed up to the militia on 4th January 1904, ten years before the war started, and his occupation was given as 'Brewer's Labourer', so he was presumably working for Fox's Brewery in Green Street Green. The 'Register of Soldiers' Effects' lists his wife as Bessie Hilda Mussell, later Bessie Lowthorpe, and indicates they had children. In the 1911 census he appears to be visiting the Thompson family in Farnborough who have a daughter Bessie, they married in early 1912. Here he is listed as a Motor Driver. Before that, in 1901 he is living with his parents and siblings in Worlds End Lane, and his father is a 'Builder's Timekeeper'. 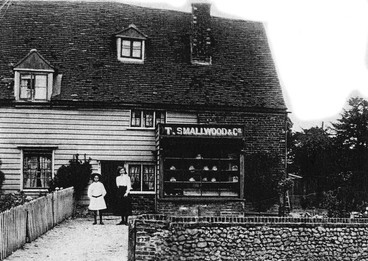 Further back, in 1891, the family are living in Downe and father Richard is a baker. In 1911 mother Ada is living in Albert Villa, Green Street Green, with some of her children. Ernest was the cousin of Jack Mussell, also on our memorial, as his father Richard was Jack’s father Henry’s elder brother. 10022 Private John Collins, of the 2nd Battalion Northamptonshire Regiment, is recorded as the son of John and Bertha Collins of ‘Bo Peep’, Chelsfield, Kent. He was 35 when he was killed in action on 14 March 1915, during the ‘Action of St Elois’ following the Battle of Neuve Chapelle. He has no known grave, but is listed on a panel of the memorial at Le Touret in Pas de Calais, France. He was awarded the Victory Medal, British War Medal and 1914-15 Star, which are the standard three medals awarded to soldiers who served in WWI. The medal card record reveals that Private Collins was sent to France on 24th February 1915, which means he died only three weeks after going to the front for the first time. John Collins was a career soldier; he was already in the army in the census taken in 1901. He was born in Pembury and his parents lived in that area for the next few years, Mr Collins working as a carter on Horseshoe Farm at Tonbridge. By 1901 they are living in the ‘Bo Peep’ area of Well Hill, near the ‘White Hart’ pub, as the Bo Peep was then known. In 1911 the family were living in Hewitts Cottages and Mr Collins is listed as being a ‘waggoner on farm’, presumably Hewitts. 233064 Able Seaman Andrew H Symons was serving on HMS Lion when it was involved in the Battle of Dogger Bank on 24 January 1915. Fighting was fierce and HMS Lion was hit several times, and at some point Symons was hit in the head by shrapnel. He was transferred to HMS Vivid, a land-based Naval establishment, and died of wounds on 29 April 1915. He is buried in the Woodlands Cemetery at Gillingham, and his memorial includes the words ‘our beloved shipmate’. Andrew Symons is listed as the son of Henry Herbert and Annie Symons of 2 Prospect Place, Green Street Green, which is probably Prospect Cottages, Pratts Bottom. Andrew Henry Symons was born in Wexford in 1889, and in 1901 he is still living in Ireland, Trabolgan, Corkbeg, Cork with his parents. The census shows father Henry is a Chief Boatman of the Coastguard, aged 43, and was born in England. His wife Annie was born in County Cork, Ireland, and they have three other children living with them, as well as Henry’s mother Ann who is 75 and was also born in England. Trabolgan is right on the peninsula south east of Cork – if you look on a map you can see why the presence of a coastguard was very important in this area. Andrew Symons joined the Royal Navy in 1909 aged 18 – his record says he had brown hair, grey eyes, was 5ft 7.5in tall and had scars on his right knee. In the 1911 census he is registered as an Able Seaman at Keyham Barracks in Devonport and his birthplace is given as Kilmuckridge, County Wexford. His Royal Navy record is very detailed and he wasn’t always a model seaman! In 1911 his parents are living in Falmouth where Henry is the Chief Officer of HM Coastguard, presumably quite an important position at this time. His mother is still living with them at the age of 84. What I can’t discover is what brought them to Pratts Bottom (Prospect Cottages are at the bottom of Rushmore Hill) less than 4 years later. On our memorial Andrew’s surname has a ‘d’ in it (Symonds), but it is Symons on all records. He is also commemorated on the new war memorial at St Margaret’s, Green Street Green, made in 1996, as is his brother Herbert Henry. Herbert was also in the Royal Navy but isn’t on our memorial, perhaps because he didn’t die until 1921, presumably of wounds sustained during the war. If you have any information on Andrew Symons, or any of the WWI casualties listed on our war memorial, I’d be very interested to hear from you. 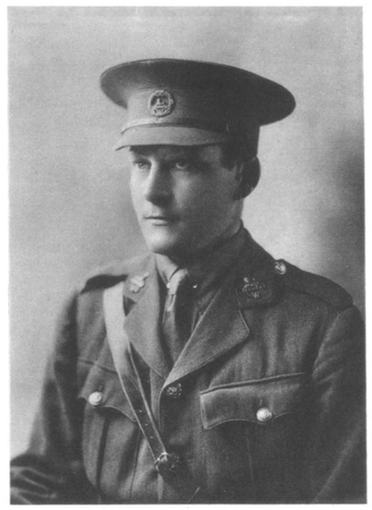 Lieutenant Wilfred Henry Wescott Haslam served in 4th Battalion of the Queen’s Own Royal West Kent Regiment. 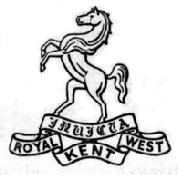 He obtained his commission in the Royal West Kent Regiment in 1913, and on the outbreak of war was sent to India, being transferred in August 1915 to the Persian Gulf. According to his medal record card he was awarded the 1914-15 Star, the Victory Medal and the British War Medal. He was killed in action aged 29 on 7 February 1916 helping to defend a camp at Butaniya in Iraq , and he is buried in the War Cemetery at Basra. Wilfred Haslam was the son of Mrs Ethel Haslam, of Dagenham House, Newton Abbot, and the late Rev Frederick Haslam, Vicar of Hernhill, Faversham. It wasn’t clear why Wilfred Haslam is remembered on our war memorial until I discovered that in 1911 he was living in Orpington with his widowed mother, a sister Dorothy and two servants. On the census their house is called Harbledown, and is next door to houses called Avoca, Summerleas and Ballyhooly in Warren Road. Wilfred was born in Rickmansworth, and in the 1891 census he is living, aged 4, with his parents Frederick and Ethel in Tweedy Road in Bromley. His father Frederick is listed as being a Clerk in Holy Orders and a Curate. In the 1901 census Wilfred is at school at Marlborough College, and in 1911 he is working as an insurance clerk. He is also remembered on the war memorial at Hernhill, and on an inscription on his father’s grave there. According to information I found on the website KentFallen, Wilfred was educated at Marlborough College from 1900 to 1904, and played for the Rugby XV at the College in his final year, winning the annual matches against Wellington and Clifton College. On leaving school he played for the Nomads, the Marlborough Old Boys team based in Surbiton, Surrey, a founding member of the Rugby Football Union. In April 1911 the club merged with Rosslyn Park, which became the preferred London club for old Marlburians. Wilfred served four years as a Private in the Honourable Artillery Company, in the City of London, while he worked as a Lloyds Insurance Broker for Messrs Dalgety & Co. of Bishopsgate Street, London. or find me in the tower ringing bells or in the choir at Evensong. 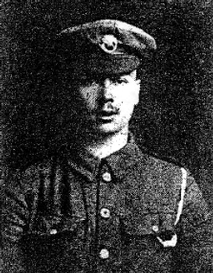 Private G/2202 Oliver Corke was killed in action, on 1 July 1916, aged 28, on the first day of the Somme. He was in the 7th Battalion of the Queen’s (Royal West Surrey) Regiment, which took part in the ‘Battle of Albert’, one of the very first offensive operations in the Battle of the Somme. Corke is buried in the Combles Communal Cemetery Extension in France. He was the son of Thomas & Naomi Corke of Well Hill, and in the 1911 census he was a gatemaker in West Hoathley, Sussex, which is where is parents were born. In 1901 the family were living in Well Hill in a cottage next to the Rock and Fountain pub, and father Thomas is listed as a ‘Lath render and park pail cleaver’ – the latter is someone who splits wood, particularly chestnut, to make gates, fences etc (thank you Richard George for this explanation). As a boy Oliver was a member of Chelsfield Church choir and of the Parish Church Sunday School. He attended the village school and in 12 July 1899 he received a prize for proficiency and good conduct from Mr Norman the Chairman of the School Board, at the annual Prizes event. One of the two well-documented of the names on the memorial, (the other being Maurice Asprey), he is commemorated in a stained glass window in the church opposite the South Door, and remembered on the family grave which is to the left of the path into the new churchyard. 2nd Lieutenant Stewart Alexander Miller-Hallett of the 11th Battalion South Wales Borderers was killed in action on 11 July 1916. He has no known grave, and is commemorated on the Thiepval Memorial in France, one of the most visually striking monuments of the battlefields. Rifleman 551287 Albert John Miles was also killed in action on 1 July 1916, aged 31. He was a member of the 16th Battalion of the London Regiment (Queen's Westminster Rifles), who were in action on The Somme taking part in the diversionary attack at Gommecourt, designed to pin German forces to their trenches and attract artillery fire away from the main assault. Albert Miles is buried at the Gommecourt British Cemetery No 2, Hebuterne in France. He was the eldest son of Enos and Harriet Miles of Well Hill; Enos was a ‘flower and fruit grower’ on the 1901 census, and Albert is a ‘house boy’. Albert attended Chelsfield School, and must have been a diligent boy as the school log records he was awarded School Board prizes for good conduct and proficiency three times, with a prize for drawing in 1896. Before enlisting he had been a butler in the household of Raymond Asquith, the Prime Minister’s son, who was himself killed in action later in the war. Pam Temple points out that this in itself is interesting, as in 1915/16 Prime Minister Herbert Asquith was coming under mounting pressure to conscript men like Miles, contrary to his own inclination. The question was whether married men should be forced to go and leave their families as opposed to volunteering, but volunteering wasn't producing enough "cannon fodder" so Asquith had to push it through, as recorded in Roy Jenkins' 1964 biography of him. Private G/4756 Walter Boothby Cade of the 1st Battalion Queens Own Royal West Kent Regiment was killed in action on 22 July 1916, aged 40. His battalion was involved in an action to capture Wood Lane, near Longueval and Bazentin le Grande; he is also remembered on the Thiepval Memorial as he has no known grave. He is recorded on the Commonwealth War Graves Commission papers as husband of Mrs Rhoda Cade of 1 Ash Road, Green Street Green, and he was father of Edward Cade, who is also on the memorial as he was in the Royal Artillery and died of wounds in September 1916. Mrs Cade lost her husband and eldest son within two months, and was left to bring up five young children. When Walter Cade signed up in December 1914, he states he was born in St Neots, Huntingdonshire, and lives at 8 Chelsfield Lane, Green Street Green; he gives his occupation as ‘baker and confectioner’. In the 1911 census the family were living at 8 Stearn’s Cottages, World’s End Lane and he was a farm labourer. Private 18325 Frederick George Checksfield was killed in action on 23 July 1916, aged 20. He was in the 1st Battalion of the Duke of Cornwall's Light Infantry, who on that day took part in an attack on enemy strong points located in the orchards to the north of Delville Wood, Longueval in France. The attack began at 3.40am and despite early success the battalion was driven back to Pont Road by enemy counter attacks. Checksfield is buried in the cemetery at Delville Wood; his gravestone has the epitaph ‘Death Divides But Memory Clings’. He was the son of Edward & Rose Checksfield of Hewitts Cottages, and his brother Sidney also joined up but fortunately survived the war. On the 1911 census it shows Frederick was born in Wateringbury and his father is at Hewitts as ‘Farmer’s Bailiff’. In 1901 the census shows they are living at Hewitts Cottages next door to John Collins, who is also on this memorial. 106169 Gunner Thomas Hopkins of the 81st (Howitzer) Brigade Royal Field Artillery enlisted on 24th August 1915 and underwent only a brief training before sent to the war. He was an scholar of Pratts Bottom and Chelsfield Village Schools. He died of wounds aged 20 on the 2 August 1916 and is buried at the Carnoy Military Cemetery in France. He was the son of Thomas & Alice Hopkins of Station Cottages, Warren Road; father Thomas worked at Court Lodge Farm. 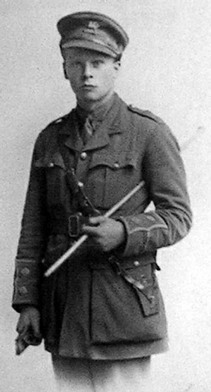 There are no records about where Thomas was injured but his brigade saw action during The Battle of Albert in which the Division captured Fricourt and took part in the Battle of Delville Wood, so it is very likely he was hurt during this and taken to the field hospital north of Carnoy, which had been established in July. In the 1911 census Thomas is 15 and a farm labourer, living with his parents and a younger brother and sister at Station Cottages; he was born in Carshalton. In 1901 the family were living in Ash Road, two doors down from a Frederick Theobald and his family. This Frederick Theobald is very likely to be the one on our memorial but I haven’t found a link yet to a specific casualty. I will keep searching. G eorge Asprey and his wife Florence moved to the Court Lodge, Chelsfield, in 1892; a well-to-do silversmith, George later became Chairman of the family business in Bond Street. Before his marriage to Florence he was a widower with a young son, Kenneth, while the family was soon added to by the births at Chelsfield of Philip, Maurice, Joan and Eric. Philip's son, also named Maurice, has very kindly lent me much family memorabilia for copying, including George's diary. That has daily entries from 1893 until his death in 1918, a wonderfully detailed account of happy family life at the Court Lodge. This was in some ways a golden era, but it was not without tragedy for the Aspreys. Joan died of meningitis in 1907 and is commemorated by a stained glass window in St. Martin's church, where the family were devoted worshippers. On the evidence of the diaries they were also model employers to their numerous servants. The outbreak of the Great War came as a sudden shock, and Maurice was soon serving in France as a Captain in the Buffs. George and Florence sent parcels of food, clothing and tobacco to him, to be distributed to the troops under him. 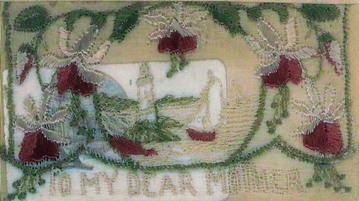 Writing to his mother from France after Christmas 1915, Maurice thanked her for her present to him, a tiepin "…it was a topping one…The men enjoyed the pudding very much indeed,…I gave the men 50 cigarettes each on Xmas Day which I got from a Field Force Canteen in Calais …I kept one box for myself, and they are quite good…. [the men] are extraordinary in their tastes. Some would give a whole box of good cigarettes away for a few wild woodbines…"
He wrote reassuringly to Florence a few weeks before his death " am up for a few weeks in the trenches. Have quite a nice dugout, weather's good and the Bosche has not been too objectionable…" Nonetheless he was killed in action, aged 23, on 12 August 1916 when commanding a Trench Mortar Battery. I have a photo of the wooden cross which was originally erected over his grave. Later the Imperial War Graves Commission erected a gravestone over his final resting place in Bray Military Cemetery. He is commemorated also on memorials in St. Martin's church and churchyard. 17681 Private William Edward Fathers of the 7th Battalion East Surrey Regiment died of wounds, aged 22, on the 17 August 1916. He is buried in Puchevilliers British Cemetery in France. For me this is one of the more moving stories, as it brings home not only the circumstances in which these men died, but the effect of the war on families. 78266 Gunner Edward Walter Cade of 150th Battery, 22 Brigade Royal Field Artillery, died of wounds age 19, on the 25 September 1916, and is buried in the Heilly Station Cemetery, Mericourt L'Abbe in France. This was a big field hospital, and the Commonwealth War Graves Commission [CWGC] website records that burials in this cemetery were carried out under extreme pressure, and many of the graves are either too close together to be marked individually, or they contain multiple burials. Edward is buried with two other soldiers who died at the same time. He was the son of Mrs Rhoda Cade of 1 Ash Road, Green Street Green; you may remember from the July magazine his father Walter was killed in action. Mrs Cade was left to bring up five young children having lost her husband and eldest son within two months. 16778 Actin g Sergeant Herbert Game served in the 11th Battalion of the Essex Regiment, and was killed in action on 15 October 1916 during the Battle of the Somme. A relative of his has given more details of his life on a website dedicated to wartime memories and I’ve included that here. The son of Robert Game and Sarah Ann Willingham, Herbert Game was born on 26 Oct 1878 in Cockfield, Suffolk. He was part of a large family with many siblings, and was an agricultural labourer. By the outbreak of the war he had married Alice Symons, the daughter of a coastguard officer, in Blackmore, Essex and had three children. In 1911 he and his family were living in Ongar Road, Brentwood. 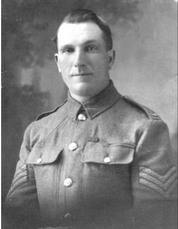 Although the exact date is not known, he volunteered to serve in the army as one of Kitchener’s K3 tranche of volunteers and served in the 11th Service Battalion Essex Regiment. He was killed during the Battle of Le Transloy, probably in a pre-dawn attack when the 11th Essex overran Mild Trench and bombed up the Beaulencourt road before being forced back by a counter-attack. His body was never found and his death is therefore commemorated on the Thiepval memorial. At some point his family must have moved to this area as his daughter Elizabeth was registered as being born in Farnborough, Kent in 1915. In 1922 his wife Alice remarried, a Robert Clark, and records on the CWGC website shows that they lived at ‘Melrose’, Chelsfield Lane (probably Worlds End Lane), Green Street Green. A/129397 Staff Sergeant Louis Percy Martin died aged 38 on 26 September 1916 of enteric fever at home here in Chelsfield. Army Service Corps (Canteen). He was the son of Samuel & Mary Martin, and lived with his wife Mary and daughter Clarissa at 4 Edith Villas, Warren Road. He is buried in St Martin's Churchyard, in the section by the car park, with a Commonwealth War Grave headstone but his name isn’t on the war memorial in the porch. Louis Martin signed up in September 1915; unfortunately, his Service Record file shows that he was discharged from military service on 3 September 1916 ‘owing the fact that his standard of intelligence was not high enough to carry out his canteen duties’. A later note says he was ‘medically unfit’. In the file there is also a newspaper cutting recording the details of the inquest following his sudden death at home shortly after; there is also a photograph but sadly it is not clear enough to reproduce here. The report says that Martin had recently returned home ill from Salonika where he had been serving with the British Expeditionary Force. It is apparent that the coroner didn’t know that he was no longer in the army. The report records that before joining up Martin had been a Ship’s Steward with the Union-Castle Steamship Company. He had also served in the Boer War on ships conveying troops. It is difficult to understand how a man who had risen to the rank of Ship’s Steward for a prestigious company could be though not intelligent enough to carry out canteen duties. It’s also a mystery why he’s not on the war memorial - if they didn’t include him because they discovered he had been discharged from the army, it’s unlikely he would have received a CWCG headstone, as these were created after the war when his full history must have been known. His service record shows he was posthumously awarded the standard serving medals and the memorial scroll of honour that all combatants received, which again was processed long after the war ended. A small mystery. L/8750 Private George Edwin Dolley of the 2nd Battalion Queen’s Own Royal West Kent Regiment died on 28 October 1916, aged 27, and he is buried in the Basra military cemetery. He was Jean Burgess’ uncle, and her brother was named after him. He was the son of Stephen and Mary Dolley who lived at 13 Laxey Road, Green Street Green. Jean tells me that George and his family lived at Halstead before the war, and the family moved to Laxey Road during WWI. George was born in Richmond, Surrey in 1888, but his father Stephen was born in Halstead, and family returned there not long before the 1901 census. Jean explains George and his brother Ernest both lied about their age to join the Army, George at 14 pretending he was 16. In the 1911 census they are both already in the Army, and are together in India. Records about his army service are sketchy but George was a prisoner of war in Mesopotamia (now Iraq) when he died. 12987 Private Herbert Charles Sewell of the 7th Battalion the Royal Sussex died of wounds on 16 April 1917 aged 40. He is buried at Etaples Military Cemetery France. He is listed as the son of the late William Alfred and Rose Sewell, and husband of Emily J Sewell of 'Retreat', Laxey Road, Green Street Green. He’s also remembered on the war memorial at St Mary’s Green Street Green. In the official Commonwealth War Graves listing he is a ‘native of Clapham Rise London’. Herbert was born in Clapham in about 1877, and on the census for 1881 he is aged three, living with parents William & Rose, and five brothers and sisters in Clapham Road. William is listed as a horse dealer but later, on Herbert’s marriage record, he is listed as a veterinary surgeon. By 1901 Herbert is living in a boarding house in Westbourne Grove, with at least 30 other people – the living conditions can’t have been very pleasant - and is listed a drapers assistant. In 1911 Herbert is living in Reedworth Street, Kennington, with his wife Emily (nee Parker), whom he married in 1903 at St Philip’s, Lambeth, and three young children, Cecil, Kathleen and Rosemary. He’s still a Draper’s Assistant, but unusually for the census it also specifically states he works for ‘Liberty & Co’. Sewell’s army service records haven’t survived but as he enlisted at Bromley, and his wife was listed as living in Laxey Road at the time of his death, perhaps he had moved to a new job in Green Street Green before he joined up. The 7th (Service) Battalion of the Royal Sussex Regiment was formed in September 1914 by men volunteering for Lord Kitchener's New Armies and landed at Boulogne-sur-Mer as part of the 36th Brigade in the 12th (Eastern) Division in June 1915 for service on the Western Front. As Herbert Sewell died on 16th April 2017 of wounds, I think it’s possible he was injured as they were taking part in the Nivelle Offensive in the Battle of Arras. The French Commander-in-Chief, General Robert Nivelle, ordered a new offensive against the German trenches, promising that it would end the war within 48 hours. The 16th April attack, also known as Chemin des Dames, after the area where the offensive took place, would be 1.2 million men strong, to be preceded by a week-long artillery bombardment and accompanied by tanks. However, the operation proceeded poorly as the French troops, with the help of two Russian brigades, had to negotiate rough, upward-sloping terrain. In addition, detailed planning had been dislocated by the voluntary German withdrawal to the Hindenburg Line. Secrecy had been compromised and German planes gained control of the sky making reconnaissance difficult. This allowed the creeping barrage to move too far ahead of the advancing troops. Within a week 100,000 soldiers were casualties. Herbert’s headstone has the simple message ‘Requiescat in pace’, which was paid for by a Miss Violet Sewell, C/o Athenaeum, 107 Pall Mall. Violet was one of Herbert’s sisters, and as in 1911 she was a Housekeeper for a large London hotel, the Hotel Russell in Russell Square, I suspect she was not a member, so perhaps she had moved to work at this esteemed London Gentlemen’s Club. 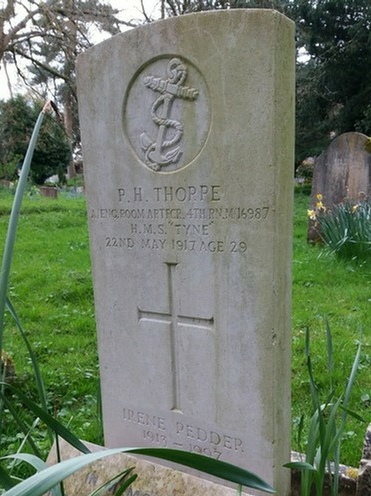 M/16987 Percy Harry Thorpe, who served in the Royal Navy as an Engine Room Artificer 4th Class on HMS Tyne, and died on 22 May 1917 aged 29. He is special for us because he is not buried at sea, or in a cemetery in a different country, but in St Martin’s churchyard. Looking at the records it appears he was invalided out of service on 23 August 1916 for tuberculosis, so perhaps he died at home but was recognised as a casualty of war because of his service. I can imagine the conditions he worked in could have contributed to his condition. Percy Thorpe’s wife is recorded as Edith Emily Thorpe of 2 Oak Road, Green Street Green, and his parents were John and Emma Thorpe of Bilsington, Ashford. I think Percy and his wife may have had at least one child, as there is an Irene Pedder buried in the same plot and her maiden name was Irene Thorpe; she was born in 1913. The Royal Naval record of Seaman’s Services says Percy was born on 8 June 1887 at Ashford in Kent. His occupation is given as Fitter and Turner. He enlisted on 12 November 1915 and served at HMS Pembroke II, then on HMS Tyne, and then at HMS Pembroke II again. His Royal Naval occupation, Engine Room Artificer [ERA], was a fitter, turner or boilermaker, competent in the workings of engines and boilers, and trained in the maintenance and operation and uses of all parts of marine engines. ERAs were the senior maintainers and operators of all warship mechanical plant. HMS Pembroke II is interesting because it was a Royal Naval Air Station, at Eastchurch, so perhaps Percy was also involved in the maintenance of aircraft for this precursor of the RAF. HMS Tyne was a depot ship, which among other things act as a floating workshop for small mobile units. Looking at his early life, on the census in 1911 Percy Thorpe is living with his brother, who was a Publican, in the White Horse pub in Long Acre, Covent Garden. Percy’s occupation is given as an Engineer for a firm of button makers. Further back in 1901 he’s living with his parents in Hambeldon, Surrey, and his father John is a Gamekeeper. G/4748 Corporal Frederick James Wickham of the 7th Battalion Queens Own Royal West Kent Regiment was killed in action on 21 July 1917 aged 33. His body was never found so he is remembered on the Ypres Menin Gate Memorial in Belgium. Frederick was the son of Mary Ann and Thomas Wickham of Oak Road, Green Street Green, and he was baptised at St Martin’s on 17 February 1884. From the 1881 census Frederick’s father was a blacksmith in Pratts Bottom but it appears he died soon after Frederick was born, as in the 1891 census Frederick’s mother Mary is a widow, living with her parents in Otford without the children. It seems the children had been found homes elsewhere, as one is on the census as having been adopted by a family in St Mary Cray. However, I can’t find Frederick, so perhaps he was also adopted and given the surname of the family he was living with. By 1901 Frederick is reunited with his mother, living with her in Banks Cottages next to All Souls church in Pratts Bottom, and working as an agricultural labourer. In 1911 he is still living with his mother and her grandson Thomas but they have moved to Oak Road, just off World’s End Lane. He married Alice Rosina Tomkins at Green Street Green on 3rd August 1912 and at the time he signed up they were living at 2 Nash Cottages, St Paul’s Cray. His attestation papers say he had already served 6½ years in the Territorial section of the Royal West Kent’s, in 1/4th Volunteer Battalion. He signed up on 30 November 1914 and is recorded as being 5ft 3½ inches tall – at that height the ½ was important! The 7th Battalion of the QORWK formed part of the British Expeditionary Force in Europe. Frederick’s army service record shows he was sent back to England in 1916 to recover from Bronchitis. It also shows he was reprimanded in the field on 12 July 1916 for ‘playing cards at 10.45pm’! In 1917 the 7th Battalion took part in the Operations on the Ancre including Miraumont and the capture of Irles, they fought during The German retreat to the Hindenburg Line and in The Third Battle of the Scarpe before moving to Flanders. I can’t find a reference to a specific battle in the period in July that Frederick was killed, so perhaps he died earlier but was only confirmed as missing on 21 July. His widow Rosina’s address is initially given as 1 Chelsfield Terrace, Green Street Green, but later she has remarried and is living in Carlisle. She received the war widow’s pension of 15/- a week. In 1918 Frederick’s mother is living at Edith Villas, New Road, Green Street Green. 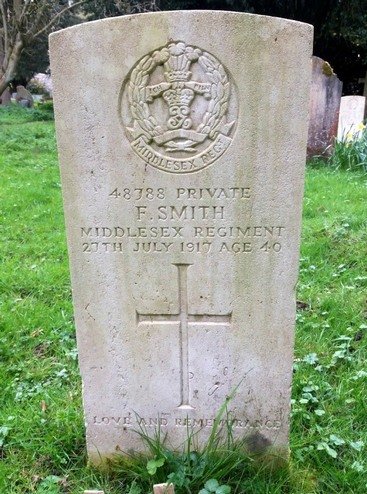 48788 Private Frederick Smith of the 52nd Battalion Middlesex Regiment died on 27 July 1917 aged 40. Like Louis Martin, Frederick Smith is not on our memorial but is buried with a Commonwealth War Grave headstone in our churchyard. As with Percy Thorpe, who died at home in May 1917, I would imagine this is because he gave loyal service before succumbing to illness and being invalided out. He lived at Rounds in Chelsfield village with his parents James and Emma Smith and their large family, and in 1911 he is registered on the census as being a carpenter for Bromley Board of Guardians, who ran the local workhouses; his army record says he had been employed by them for 13 years. His father James was also a carpenter. Frederick signed up in November 1915, but was discharged in December 1916 as being no longer physically fit for war service, and it appears he was never sent to the Front. Sadly his army record shows he developed cancer, and it seems he married his wife Lucy only two months before he died. Sapper William Hills of the 254th Tunnelling Company, died of wounds in Rouen on 4 August 1917 aged 41. William was one of 8 children and 2nd son of Thomas & Elizabeth Hills born in Spring 1876 at their cottage on Well Hill. Thomas Hills was an agricultural labourer. He had married Elizabeth Baldwin from the adjacent parish of Eynsford just six years earlier. They wasted little time in having William christened at the ancient parish church of St Martin of Tours on 19 March 1876. In 1891, William aged only 15, was lodging with the family of John Mitchell, the foreman of Court Lodge Farm where he was employed to tend the horses. In February 1898, William just turning 22 married Susan Ann Hayes. William and Susan first set up home in a house in Lower Road, Orpington. But it meant William had been obliged to leave the land and work instead as a navvy on the railways. By 1911 he was working for his uncle, John Baldwin, as a waggoner at Hulberry Farm. William and Susan had to wait an agonising 15 years before they had their first child. Florence was born in November 1913. In less than two years his life was twice rocked by tragedy. Little Florence lived only a few weeks and died in February 1914. The couple moved to another farm, Waldens, just three miles along Eynsford Road from Hulberry Farm. William had secured another position there, again as a waggoner. On Friday, August 7, 1915 Susan collapsed. The local doctor was called but she was already dead from cerebral haemorrhage. In just 18 months William had lost his entire family. This personal tragedy took place in the midst of a national crisis. Across the channel the savage conflict in France and Belgium was accompanied by daily reports of a staggering loss of life among the British forces. 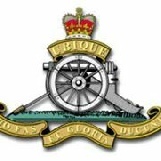 At the time of Susan’s death the British army still comprised of volunteers. But within just a few months a new scheme was introduced, a precursor to conscription, and although William was now nearly 40 years old he would be caught in the net. By the end of 1915 William had come forward to “attest” his eligibility for service. He was given a grey armband with a red crown to indicate he had volunteered and was placed in the Army Reserve. In July 1916 he received his orders. He was to join the British Expeditionary Force. On his attestation form William had described himself as an “excavator” rather than a waggoner. This, together with his diminutive stature (he was only 5 foot 4 inches tall) meant he was immediately identified for one of the most demanding jobs on the front - a tunneller. Sapper William Hills joined the 254th Tunnelling Company of the Royal Engineers and was sent to Clipstone Camp in Nottinghamshire for a month’s training before posting to Flanders. In September 1916 William was near the town of Bethune. Here by the tiny village of Givenchy the two armies had been waging an underground war since the start of hostilities. Throughout the second half of 1916 William and his comrades were digging tunnels deep under enemy lines. When the mines they placed in those tunnels were detonated everything and everyone immediately above was destroyed. The work was backbreaking and dangerous and the risk of a tunnel collapse ever-present. Sometimes it was just an accident but more often it was the consequence of enemy listening devices detecting the Allied digging. In May 1917 William’s 254th Tunnelling Company was sent to Ypres. When the tunnellers weren’t working underground they were employed in building and maintaining trenches and roads just behind the front line. Ironically it was working on this mundane task rather than the infinitely more dangerous tunnelling work that placed William in mortal peril. In the early hours of the morning of July 31, 1917 the British launched the third Ypres offensive and triggered the bloody episode now known simply as Passchendaele. Torrential rain was falling as the sappers of the 254th Tunnelling Company were sent forward to work on the roads in the front line. The company’s war diary names the area of activity as around St Jean and Wiltje. These are two small settlements only a mile apart and now called Sint-Jan and Wieltje that lie just to the east of Ypres. When the opening barrage began at 3.50 am on July 31 the front line ran north to south through Wieltje. The sappers of the 254th Tunnelling Company were operating on the edge of the unfolding battle. On that first day British troops pushed forward behind the advancing artillery bombardment and by day’s end had advanced the line several hundred metres. But German forces had not been completely eliminated. In isolated pockets behind the new front line there were machine gun nests and fortified farms still under their control. The following day William Hills and his comrades were again deployed on roadwork, but now in the previously occupied area beyond Wieltje. The conditions were shocking. The terrain, already churned up by artillery fire and destroyed German fortifications, had been turned into a quagmire by the heavy rain. Unexpectedly the team of sappers became exposed to enemy fire. Three of William’s comrades were killed outright. He and another six sappers were wounded. Suffering from gunshot wounds to the legs he was carried by stretcher-bearers through the mud first to a nearby dressing station and then to a Casualty Clearing Station behind the front line. But the severity of his wounds meant he had then to be transferred to the Base Hospital 140 miles to the south in Rouen. It’s possible that he didn’t survive the long trip south or perhaps he clung on for a day or so at the hospital the Allies had erected on the Rouen racecourse. The official records only show that on 4 August 1917 Sapper William Hills died from wounds. Today William Hills lies alongside 12,000 of his comrades at St. Sever Cemetery in Rouen. An abridged version of ‘Well Hill brothers in Arms,’ by Shaun Brown – read the full story. 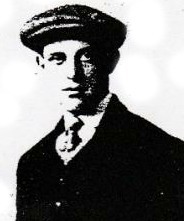 G/11003 Private Arthur Morgan, of the 8th Battalion Queens Own Royal West Kent Regiment, was killed in action on 9 September 1917, aged 29, during one of the minor skirmishes around the major battles of Passchendaele. He is buried at the Hooge Crater Cemetery in Belgium, his body having been moved from a smaller cemetery in Zillebeke. Arthur was the son of John & Emma Morgan and according to his military service record he lived with them at Maple Cottage, Maypole, Chelsfield. He was christened at St Martin's on 1st April 1888 and in the 1891, 1901 and 1911 censuses he's living with his parents and family at Maypole, and is an agricultural labourer like his father. He enlisted in November 1915 and was posted to France as part of the British Expeditionary Force in May 1916. His service record shows he was hospitalised in Bordeaux with bronchitis in February 1917 but was posted back to the frontline in March. Each family of a deceased soldier had to complete a form giving details of their next of kin and close family members, which is then witnessed by a minister or magistrate (in this case Arthur Waring). The form was completed in August 1919 and his brother James is listed as 'on active service North Russia', so at least he survived the war, but he was now the only son, so it must have been difficult to have him so far away. G/4614 Sergeant Joseph Edward Potter of the 7th Battalion Queens Own Royal West Kent Regiment was killed in action on 12 October 1917 aged 25. He has no known grave so he is remembered on the Tyne Cot memorial in Belgium. Joseph was the son of James & Eleanor Potter, he was born on Ide Hill but the family moved to Maypole Cottages, Well Hill shortly after; father James’s occupation in 1901 was ‘carter on farm’. At the time of the 1911 census Joseph was a footman for the Honourable Frederick Anson, a son of the Earl of Lichfield, who was then living at Cell Barnes Manor, St Albans. Joseph signed up in November 1914, very early on – perhaps because he was working in the household of such high-ranking aristocracy there was pressure to support the cause. His service record shows 12th October is an assumed date of death as he was missing in action. It also shows that his brother Thomas was also serving and was ‘on his way to West Indies, Royal Marines, HMS Malabar’. 37473 Gunner Julius George Bailey of the 150th Heavy Battery Royal Garrison Artillery died of wounds on 13 October 1917 aged 24 (according to the official record) and is buried in Dozinghem cemetery in Belgium. Heavy Batteries were equipped with heavy guns, sending large calibre high explosive shells in fairly flat trajectory fire. As British artillery tactics developed, the Heavy Batteries were most often employed in destroying or neutralising the enemy artillery, as well as putting destructive fire down on strong points, dumps, store, roads and railways behind enemy lines. Julius was the son of Arthur Henry Bailey, landlord of the Bulls Head Hotel, Chelsfield Valley [Pratts Bottom], and his wife Ellen. Born in Stoke Newington in 1895, by 1901 Julius is living with his parents in Hackney, his father is a commercial clerk and they have two servants. I don’t know when his father took over the Bull’s Head but it appears he is there by the time Julius signs up for the army in 1912. Julius Bailey’s service record is available online, but the scans show evidence of the fire that destroyed many of the records when they were in storage during WWII. From what’s left it’s possible to see that he signed up at Great Yarmouth in 1912 aged 19, and during his early years of service he was posted to India, before returning home, and then joining the British Expeditionary Force in France. This record shows he had a brother in the 7th Hussars. In the medical section, there is evidence that he was treated near home for some things, there is a reference to ‘Ontario Military’ which is almost certainly the military hospital on the site of what is now Orpington hospital, on the next line he is treated at ‘Addington Park War Hospital’. There is also the official document listing the return of his effects to his family, among which is ‘letter, scarf, 2 pairs socks…2 candles…a tin of crab…air pillow…22 carat gold ring’, all signed for by his father. G/4952 Private Albert Edward Cornwell [Cornwall on the memorial] of the 1st Battalion Queens Own Royal West Kent Regiment killed in action 26 October 2017 aged 20 years old. He was the son of Albert & Emma Cornwell of 8 Kingsley Road, Green Street Green. He lived with his wife Rose Eleanor (nee Attwood) and daughter at 23 Turpington Lane, Bromley Common. Albert was born in Redhill, Surrey, but by 1911 he was living in Kingsley Road with his parents and eight siblings, and gives his occupation as ‘House Boy’. His father was a bricklayer’s labourer. One of three servicemen on our memorial killed in action on the same day. They have no known grave and are remembered on the Tyne Cot memorial in Belgium. 26 October was the first day of the Second Battle of Passchendaele, which was the culminating attack during the Third Battle of Ypres. The battle took place in the Ypres Salient area of the Western Front, in and around the Belgian village of Passchendaele, between 26 October and 10 November 1917. L/10740 Lance Corporal Henry George Kimber of the 2nd Battalion Queens Own Royal West Surrey Regiment killed in action 26 October 2017 aged 31 years old. He was the son of Mrs Esther Kimber of 2 Kingsley Road, Green Street Green. Henry was awarded the Military Medal on 26 May 1917. This was awarded to personnel below commissioned rank for bravery in battle on land. Over 115,000 awards were made for actions during the First World War. In 1911 Henry is in the army, a member of the Royal Scots Fusiliers and stationed in South Africa. The ‘Register of Soldiers’ Effects’ lists his next of kin as Mother Esther, and sisters Mary Barrett, Clara Osborne, Alice Theobald. This last is interesting as I think she could be the wife of Frederick Theobald, also on the memorial, but I have yet to trace more details for him. Henry was 15 when the previous census was taken in 1901, and he was living in Worlds End Lane with his mother and his father Henry, who was a ‘Railway Platelayer’. Henry junior is a ‘Gardener (domestic)’. 33663 Private George William Smallwood of D Company, 2nd Battalion The Border Regiment killed in action 26 October 2017 aged 26 years old. He was the son of Thomas James & Annie Smallwood of The Bakery, Crosshall, Chelsfield, and the husband of Mary Eveline Smallwood of Llandaff. Geoffrey Copus has sent me a photograph of something that George’s nephew, Peter Beal of Crockenhill, showed him – a poignant greeting card, typical of many produced in France & Belgium for British servicemen. It is embroidered with a silk floral pattern and the words ‘to my dear Mother’, and inscribed ‘with love and best wishes from your loving son George, France, July 28 1917’. In 1911 George is a cowman on a farm in Addlestone in Surrey. Earlier, in 1901, he’s living with his parents and siblings in the bakery at Crosshall in the heart of the village. G/20745 Private Thomas Henry Wickenden of the 2nd Battalion of the Royal Sussex Regiment was killed in action on the 21 November 1917 aged 29. He has no known grave and is commemorated on the Tyne Cot memorial in Belgium. 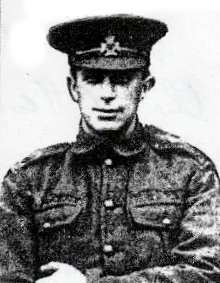 Thomas’s battalion was part of the 1st Division of the British Expeditionary Force and he was killed in a minor skirmish at the end of the Second Battle of Passchendaele. Thomas was born in Chelsfield and was the son of Herbert Henry & Harriett Wickenden of Julian Brimstone Farm, Church Road. In 1911 he was living with his parents and siblings on the farm and was working as a waggoner, as was his father. His father was born in Seal, his mother in Wrotham. Ten years earlier they are living in the same place and Thomas’s occupation is ‘house boy on farm’. The Army Register of Soldier’s Effects shows that his pay and pension went to his widow Mabel, who he married in October 1916 at St Paul’s, Sutton at Hone. Mabel’s occupation is given as ‘Munitions Worker’ and Thomas’s as ‘Horseman’. 574105 Rifleman John Thomas Hills of the 1st/17th Battalion, the London Regiment, died of wounds on 30 November 1917 aged 38. He is buried in Orival Wood Cemetery, Flesquieres, France. John was the son of Tom & Elizabeth Hills of Well Hill, and husband of Emma Harriet of Stockwell. Strangely he is not commemorated on our memorial even though his brother William, who died in August 1917, is. 201722 Sapper Harry James Minns of the 96th Light Railway Operating Company, the Royal Engineers, died on 30 December 1917 aged 28. He is buried at Alexandria (Hadra) War Memorial Cemetery in Egypt. He was the husband of Daisy Minns of Canterbury Villas, High Street, Orpington, and the son of Arthur & Emily Maria Minns of 12 Foxes Cottages, Green Street Green. He’s living with them and brother Frederick in 1911 and his occupation is ‘painter’; his father is a ‘builder’s carpenter’. Harry and his brother were born in Green Street Green, but their parents were born in Thurton, Norfolk. RE Light Railway Companies were formed in early 1917 and transformed the operational abilities of the army. Goods and men could now make the last leg of the journey to the front by light rail, using fewer men and horses, and reducing traffic and wear on roads. Men in a Railway Company ran the railway, and carried out all the roles: Drivers, Brakesmen, Guards, Wagon Repairers, Repair Shop Engineers, Traffic controllers and Storesmen. The 96th Light Railway Operating Company only arrived in Alexandria in December 1917 so Harry died very soon after being deployed. 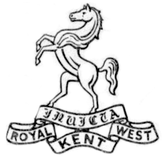 L/8711 Sergeant Garnett Edward Davies of B Company, 1st Battalion of the Queen’s Own Royal West Kent Regiment died of wounds aged 24 on 10 September 1914, very early on. His battalion was involved in the action of the British infantry to cross the river Marne in the days before his death, so he was probably wounded during this operation. He has no known grave and is remembered on the La Ferte-Sous-Jouarre Memorial in France. Garnett was the son of Frederick & Agnes Davis, and at the time of the creation of De Ruvigny's Roll of Honour, a book listing all those who lost their lives in the war, they lived at 9 Devonshire Square, Masons Hill, Bromley, Kent. Garnett’s brother Sidney lived in Vine Road after the war, which may be why he is remembered on our memorial. Garnett was born in Farnborough and was baptised there in June 1891. In 1901 family are living at No. 4 Prospect Place, Farnborough, and father Frederick is an Ostler, but by 1911 they are at Devonshire Square and he is a Bar Keeper. Garnett himself is already a Lance Corporal in the army by this point, stationed at Bordon in Hampshire. 203792 Private William George Martin of the 8th Battalion, the Queens Own Royal West Kent Regiment was killed in action, aged 38, on 22 March 1918. He has no known grave and is remembered on the Pozieres Memorial in France. The 8th Battalion was involved in a heavy German attack starting on 21 March, and subjected to a tremendous bombardment. They are reported as having put up a very resilient front but they were handicapped by the losses they had already sustained and ten days at the front with no respite, and were fighting in very misty weather conditions. It’s therefore not surprising that many men were lost and their bodies not found. William was the son of Caroline and the late Alfred Martin, of Downe, Kent; and the husband of Matilda Mary Martin. William was born in Downe, and in 1891 he is living with his parents and two sisters in Mabel Cottages in the village. His father Alfred is a boot maker. In 1911, William and his wife are running a Newsagent & Tobacconist store in High Street, Green Street Green and he is also listed as being a house decorator. 200356 Private William James Stanley Morris of the 4th Battalion, the Queen’s Own Royal West Kent Regiment who was killed in action, aged 21, on 25 March 1918. He is buried in the Roye New British Cemetery, France, and the Commonwealth War Graves Commission site records that the inscription on his gravestone is ‘Until memory fades and life departs you’ll live forever in our hearts, Mum, Dad and Sisters’. Roye New British Cemetery was made after the Armistice when graves were brought in from the battlefields and from other burial grounds. The records show that William was one of these, rescued from one of the battlefields. William was the son of William James & Ada Jane Morris of 2 Elm Road, Green Street Green, and in 1911 he is living there with them and his siblings. He is the eldest child, the only son and has four younger sisters, which gives us the picture behind the gravestone inscription. William’s father was a drayman for Fox’s Brewery at Green Street Green, and his mother Ada’s maiden name was Blundell, a well-known local family. 33689 Private Albe rt Victor Hockin [Hocken on the memorial] served in the 9th Battalion, the East Surrey Regiment, and died of wounds on 13 April 1918 aged 32. He is buried in the Roye New British Cemetery in France. The 9th Battalion of the East Surreys were raised as part of Kitchener’s Army and sent to France. This East Surrey Regimental War Diaries are available online for free, and the entry for 10th April 1918 is ‘The Remnants of the 9th Bn East Surreys paraded and were inspected by Brigadier R W Morgan, DSO, who spoke to the Battalion of the great sacrifice Major C A Clark and all the officers and nether ranks of the Battalion had made East of Hallu on the 26th March 1918.’ I would guess from reading the report of this action this is probably where Albert Hockin may have received the injuries that eventually killed him. 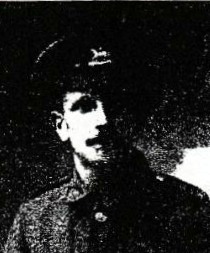 As Albert was listed as missing at the end of March, one could also read between the lines that he lay injured undiscovered on the battlefield for a while which would have lessened his chances of recovery. Albert’s story is one of the more interesting ones I have researched, and demonstrates how much it’s possible to work out from just a few online documents. The first document I found was the census for 1911 which shows Albert lived with his wife Adeline and young son Thomas at 8 Fox's Cottages, Green Street Green, and he was a Waste Inspector for the Water Board, but he was born in Melbourne, Australia. This in itself was intriguing – I know that many British people left for a new life in Australia in the late 19th and early 20th centuries, but I thought the Australian invasion of the UK was a more recent thing! The 1891 census shows that Albert, aged 4, is living with his widowed mother at the house of his grandparents, Bartholomew and Elizabeth Hockin, in East Dulwich. From the relationships information on the census, it’s clear the grandparents are his mother’s parents, and yet they have the same surname. From this census I can also see that his mother Harriet was born in Gateshead and his elder brother was born in Surrey, but his younger sister was born, like him, in Australia. It therefore appears his parents went to Australia for a new life in about 1885, and then when his father died his mother returned to live with her parents. What a life for his elder brother – losing his father and a journey to Australia and back by ship by the age of seven. But what about the surname? She could have remained unmarried and had four children but the census recorded she was a widow. Perhaps the parents were actually her in-laws and the census recorder just hadn’t been very accurate. I then found a probate record for ‘Thomas Clark Hockin, formerly of Bodriggy-villas, Hayle, Cornwall…but late of Riviere House…Melbourne Australia, Draper, who died 16 June 1889’. Probate was granted to Harriet Hockin of 1 Terris Road, East Dulwich, Widow – Terris Road is the address in the 1891 census so Thomas Clark must be Albert’s father. I looked at censuses further back, and sure enough Harriet, born in Gateshead, was Bartholomew and Elizabeth’s daughter, not daughter-in-law, so she married a man with the same surname. Further research of Thomas Clark Hockin shows he was her cousin, the son of her father’s brother. By the 1901 census Harriet has married again, a Samuel Allen, and they are living at Knole Villas, Sevenoaks Road, Orpington, with Albert, his sister Rosa, and three younger children from the new marriage. Samuel is a Water Inspector; Plumber, and Albert aged 14 is also listed as a plumber, so it seems he follows his stepfather into the trade. You may remember in the 1911 census Albert was living with his wife and son at 8 Fox’s Cottages, Green Street Green. Thanks to Patrick Hellicar, who sent me a beautifully coloured auction plan from when the whole estate was sold in the 1920’s, I know that this cottage was the right hand one of a pair on Green Street Green High Street, almost opposite what is now the Shell garage. There is still a pair of cottages on the site but they have been extensively renovated and it’s difficult to tell if they are the originals or a newer build – perhaps someone could tell me! M2/049361 Private Henry George Jarvis of the 37th Division, Mechanical Transport Company of the Army Service Corps, died of wounds on 25 May 1918 aged 25. He died in a casualty clearing station and is buried in Bagneux British Cemetery, Gezaincourt in France. He was the son of Henry George and Emily Jarvis, of Prospect Place, Keston, Kent, and the husband of Emily Jarvis, who is registered at living at 7 Laxey Rd, Green Street Green after the war. The inscription on his gravestone is ‘Gone but not forgotten RIP From his loving wife Emily and daughter Irene’. His daughter was only two when he died. Henry signed up in February 1915 when he was living in Westmoreland Road, Bromley, and the service record shows he was given leave to marry Emily in November that year. On his record his occupation is listed as ‘chauffeur’, and I found a beautiful recruitment poster for the Army Service Corps from 1915 aimed at 'motor drivers', which is a good indication as to how he came to be in the Mechanical Transportation Company. Emily is listed in the service record as ‘Emily Chicksfield’, but a little bit of research proves this is actually ‘Checksfield’ and she was related to the local family of that name, which is probably why she moved to Laxey Road once her husband had died. The service record also reveals that Henry had a brother Charley, and sisters Ethel, Elsie, Dollie and May. Jarvis was born in North Finchley but by 1901 he is living with his parents and siblings at 17 Prospect Place (now Croydon Road) in Keston. By 1911, aged 17, he is working as a gardener. His parents Henry and Emily came from Oxfordshire and his father is listed as a jobbing gardener. L/9087 Private Walter John Murrell of the 2nd Battalion, the Queens Own Royal West Kent Regiment was killed in action on 24 July 1915, aged 26 and is buried in a communal grave in Basra War Cemetery in Iraq. The ‘Soldiers Effects’ records show he was part of the Mesopotamian Expeditionary Force [MEF] and he died at Nasiriyah. During the First World War, Basra was occupied by the 6th (Poona) Division in November 1914, from which date the town became the base of the MEF. The cemetery at Basra now contains 2,551 burials of the First World War, 74 of them unidentified. The headstones marking these graves were removed in 1935 when it was discovered that salts in the soil were causing them to deteriorate. The names of those buried in the graves affected are now recorded on a screen wall. The history of the ‘Queen’s Own’ RWK regiment during WWI has been carefully documented in a book by C T Atkinson published in 1924, and someone has kindly put this all online (see link below). There is a very detailed account of the events leading up to the day John Murrell died. A General Nixon had taken over the command of the MEF in April, and in early July it’s noted that although the 2nd RWK had no chance of proving its qualities in action (they were kept away from the main battlefront for a period of time), ‘it distinguished itself by the lowness of the sick rate and by the splendid way in which the men had stuck to their work, often fainting from sheer exhaustion and yet managing to march in with the rear guard. But the battalion was soon to have fighting of quite sufficient severity to satisfy anyone.’ General Nixon had received orders to prepare for the occupation of the Basra district, which meant securing the Tigris river up to Kut al Amara and the Euphrates to Nasiriya. The 2nd Battalion were directed to the Nasiriyan front where ‘they found the British troops established in trenches among palm-groves on both banks of the river, with the Turks strongly entrenched opposite them.’ At 5am on the 24th the bombardment opened, and it’s reported to be a heavy one by Mesopotamian standards, but the Turks put up a stiff resistance. The leading companies went over the top at 5.30am, and an officer of the 90th Punjabis reported that ‘It was the most magnificent sight to watch those fellows going up under the terrific fusillade from their front, in spite of the casualties, just as if they were on manoeuvre parade.’ The battle raged all day, and the account by Atkinson is very detailed and worth reading if you are interested in the day to day life of a solider in the midst of battle. Victory was decisive, the resistance of all local opposition ceased, but although less than 500 men had actually taken part but there were over 150 casualties including our John Murrell. There isn’t very much information available on Murrell before he joined the army. In 1901 John is living, aged 9, with his father Edward and stepmother Mary Ann in Grove Road, Redhill, and his father is listed as a General Labourer. By 1911 Edward and Mary Ann are living in Elm Road, Green Street Green, but John is already in the army, and is posted in India, having enlisted in Orpington. G/12032 Private George Pierce of the 6th Battalion, the East Kent Regiment (‘The Buffs’), was killed in action on 2 July 1918, aged 38. He is buried in the Harponville Communal Cemetery Extension in France. He was the husband of Mrs Sally Pierce of 9, Long Row, Chelsfield Lane [World’s End Lane]. I’ve tried to find out what action George’s regiment were involved in when he died. There were no major offensives going on at the beginning of July but the 6th Battalion were part of the 12th Division in France, who carried out an attack on Bouzincourt on 1st July. George Pierce was born in Bolney East Sussex, and in 1891, aged 10, he’s living in Bolney with his parents, John and Sarah, and three brothers; father John is milkman on Collwood Park farm. In 1901 he’s living with his wife Sally and father in law in Burwash and is a stockman on a local farm. By 1911 George & Sally are living in World’s End Lane with four children, aged from 1 to 9, and George is a cowman on a dairy farm. George’s army service record survives which gives us a little more insight into his last few years. He signed up in 1916 aged nearly 36, by which time he and Sally have seven children. There are a couple of entries on the Record of Conduct pages – for neglect of duty at one point he was deprived of the Lance stripe he’d been awarded, then for overstaying his leave to England by one day he was docked 7 days’ full pay, which seems quite severe when one imagines the journey back was not exactly easy. Another piece of paper in the file records the articles that were returned to his wife at his death - a letter, a notebook and a watch. Mrs Pierce moved back to Witherenden Hill, Burwash after her husband's death. As his widow she received a pension of 43s 1d per week for her and six children. 92736 Private George Akhurst of the 2nd Battalion, London Regiment of the Royal Fusiliers was killed in action on 27 August 1918 aged 18. He is buried at Hem Farm Military Cemetery, Hem Monacu, in France. He was the son of George & Martha Akhurst of 6 Prospect Cottages, Pratts Bottom. From the medal records it seems George was initially assigned to the King’s Royal Rifles on 2nd August 1918, then after a week transferred to the London Regiment of the Royal Fusiliers, and he died two weeks after that. If true this must have been particularly tough for his family, as he was only in the army for a month before he died. I haven’t been able to find out what action his unit was involved in on the day of his death but the cemetery is in the middle of the area of the Battles of the Somme. What do we know about George’s all too short life? His army record gives his first name as Alfred but this isn’t used on the memorial or on the census records. In 1911, he is living with his parents and two younger sisters at 2 Shorters Cottages, Pratts Bottom, and the census shows he was born in Deptford. George’s father, also George, was a farm labourer and in 1901 he’s living with his wife and a one year old George in Deptford. Father George was born in Cudham, and looking further back to 1891 he’s living in Pratts Bottom with his uncle and aunt, which may explain why he returned there with his family a few years later. 51791 Private Henry Henkley Scrivens, of the 11th Battalion, Royal Fusiliers, was killed in action on 21 September 1918 aged 40. He is remembered at Vis-en-Artois Cemetery France. This Memorial bears the names of over 9,000 men who fell in the period from 8th August 1918 to the date of the Armistice in the ‘Advance to Victory’ in Picardy and Artois, between the Somme and Loos, and who have no known grave. Henry was the husband of Lydia Louise Mary Scrivens of 3 Sterns Cottages, World’s End Lane, Green Street Green, and in 1911 they were living there with two daughters, her mother and brother. Henry is a farm labourer and was born in Farnborough. In 1901 Henry is living in the same row of cottages with his mother Emma and he’s listed as a ‘market gardener’. They have four lodgers, two of whom are working at the brewery, and one is a laundress. Back in 1881, Henry is living with Emma and his father, also Henry, and three siblings in Church Road, Farnborough. This serviceman is also remembered on the memorial at St Mary’s Green Street Green which was created in the 1990s. 48859 Private William Dent of the 1st Battalion, the Northamptonshire Regiment, died of wounds on 23 October 1918 aged 20, and is buried in the Highland Cemetery at Le Cateu in France. The Commonwealth War Graves Commission records show that William’s mother was Ellen Golding of 7 Long Row, Green Street Green. I’ve been doing some further research to find William Golding, another of the six (now five) as yet untraced servicemen, and have come across letters from Ellen about the allowance she should be paid as a soldier’s wife with children. They also show that William’s family name was probably Dence not Dent. William was born in Belvedere, and in 1911 he’s living at Maypole with mother & Thomas Golding. In 1901 he’s living with Ellen and his father Harry Dence in Upper Abbey Road, Belvedere; Harry is a labourer and was born in East Malling. S/21984 Private Frederick Theobald of the 1st/28st Regiment of the Rifle Brigade, posted to the Artists’ Rifles, and he was killed in action on 27 September 1918 in France. He is buried at Moeuvres Communal Cemetery Extension near Cambrai. Frederick was one of six names on the memorial I couldn’t find details for. I could find several F or Frederick Theobalds who are listed as being casualties of WWI, but I couldn’t find anything to link one of those to Chelsfield. I found a Frederick Theobald living in Green Street Green in 1911, and so I’ve used the information on censuses and birth, marriage & death records to make an educated guess at which of the servicemen was ‘our’ Frederick. The Frederick Theobald in Green Street Green in 1911 was living with his wife Alice and two children in Flint (or Garden) Cottages; he’s listed as born in Farnborough, Kent and he’s a farm labourer. This Frederick is on the 1901 census living with his parents John & Elizabeth in Ash Road, and he has the middle initial J. No service record survives that has any of this information to link it, but on the Army Registers of Soldier’s Effects, the entry for one Frederick James Theobald lists his widow as ‘Alice R’. An Alice Rose Kimber married a James Frederick Theobald at Chelsfield in 1905, and we have an Alice R and a Frederick James on the Soldier’s Effects record. Frederick is listed on the 1891 census as James F so it looks like he swapped his two first names around at some point. I think all this is enough to assume this is probably ‘our’ Frederick, although research was slightly hindered by the fact that his surname is spelled differently (Theobold) on the Commonwealth War Graves Commission website. 290762 Private Harold William Heselden of the 1st Battalion, Bedfordshire Regiment (formerly the Huntingdon Cyclist Battalion) died at the VAD hospital at Ampthill on 26 October 1918 aged 27, and is buried in St Clement’s churchyard in Skegness. 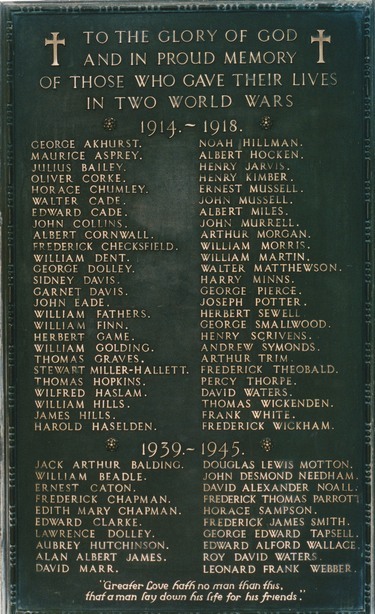 Harold’s surname is spelled Haselden on the war memorial but this appears to be an error as all records have it as above. The Bedfordshire Regiment were involved in the final 100 days of battle in 1918, and it seems that at some point Harold was injured and brought home to a hospital near regiment headquarters. I don’t know why he was buried in Skegness but perhaps his wife moved there. Harold was the son of Walter and Susan, and in 1911 he’s living with his widowed mother in Crown Road, Green Street Green, and gives his occupation as gardener. Also in the house is his sister Eleanor and her husband David, whose name is also recorded on the memorial. 115264 Driver Arthur Stanley Trim of the X 7th Trench Mortar Battery, Royal Field Artillery, died of wounds on 27 October 1918 aged 24, and is buried in the Giavera British Cemetery Arcade in Italy. He was the eldest son of Thomas and Mary Trim of 5 Chelsfield Lane, Green Street Green [the bottom end of World’s End Lane]. In 1911 he is living with his mother and two brothers in Elm Road, and he is working as a grocer’s assistant. This census shows his mother was born in Portisham in Dorset, but he was born in Fulham. Further back in 1901 he, his mother and brother Frederick are living with his mother’s father in Bradford Peverell in Dorset. There is no sign of father Thomas on either of these censuses, but Mary is categorised as married rather than a widow, and Thomas is acknowledged on the war grave records, so perhaps his work took him away from home. Arthur’s Battery took part in the Passage of the Piave (23 October-4 November 1918) during the final Battle of Vittorio-Veneto, and it would probably have been during this action that he was injured, so close to the Armistice. The Italian victory in this action marked the end of the war on the Italian Front, secured the dissolution of the Austro-Hungarian Empire and contributed to the end of the First World War just one week later.